In the boxes: Homemade nuggets, peas & corn salad, babybel chesse, apples, sausages & snacks. My kids have been asking for angry birds bento for a long time and I finally get down to doing it. 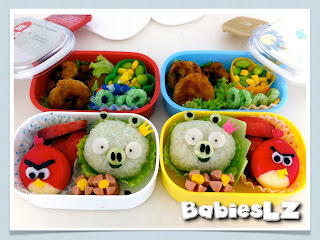 So here's my humble Angry Birds bentos for my kiddos. Noticed something missing? Well, it's the eyebrows for the green birds! It was all cut out but I was in a hurry that I forgot to put it! My kiddos were happy even though their mommy forgot about the eyebrow. Hehe... That's what matters most isn't it?